Our readers often ask us if it is possible to get Lightroom to provide the same colors as one would see from camera-rendered JPEG files when shooting in RAW format. Unfortunately, as you might have noticed when importing files, Lightroom changes the colors immediately after import, when the embedded JPEG files are re-rendered using Adobe’s standard color profiles. As a result, images might appear dull, lack contrast and have completely different colors. I have heard plenty of complaints on this issue for a while now, so I decided to post series of articles for each major manufacturer on how to obtain more accurate colors in Lightroom that resemble the image preview seen on the camera LCD when an image is captured. In this article, I will talk about matching colors from a Nikon DSLR in Lightroom. Due to the fact that Adobe’s RAW converter is unable to read proprietary RAW header data, which often contains chosen camera profiles, some settings have to be either applied manually or applied upon import. 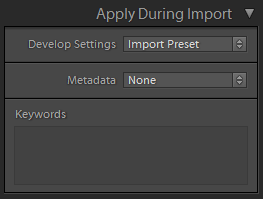 My personal preference is to apply a preset while importing images, which saves me time later. Before we get into Lightroom, let me first go over camera settings and explain a few important things. When shooting in RAW format, most camera settings like White Balance, Sharpness, Saturation, Lens Corrections and Color Profiles do not matter. Unless you use Nikon-provided software like Capture NX or View NX, all of those custom settings are mostly discarded by third party applications, including Lightroom and Photoshop. That’s because it is hard to process each piece of proprietary data, which is subject to change from one camera model to another. Now imagine trying to do this for a number of different camera manufacturers! All of the above settings do not affect RAW files in any way. Whatever you choose in your camera simply gets written as header information to Nikon’s NEF files. Please note that “Long Exposure NR” is the only setting that affects RAW files. However, Adobe will still not know if Long Exposure NR was turned on or off in your camera. Because the above settings do not affect your RAW files, they are essentially of no use, so I would recommend to keep them turned off by default. You might be wondering why the image on the back of the LCD changes when you pick different Picture Controls or other settings while shooting in RAW. That’s because RAW files actually contain full size JPEG previews, which is what your camera shows on the back of the LCD. Hence, any change you make in your camera will simply be reflected in the embedded JPEG file only. When RAW files are imported into Lightroom / Camera RAW, the embedded JPEG file is discarded and a new one is generated, based on Adobe’s default settings, or a chosen import preset. That’s why when I talk about getting more accurate Nikon colors in Lightroom, we are simply trying to match Nikon’s default rendering of colors in JPEG images to those rendered by Lightroom or Camera RAW. Remember, a RAW file is just like unprocessed film – you can interpret and process colors any way you like. However, changing camera settings can indirectly affect your RAW files. For example, if you have Active D-Lighting turned on (which simply applies a tone curve to the embedded JPEG image), you might think that you have enough shadow details in your image and you might end up underexposing the image. High ISO Noise Reduction might make it seem like you do not have much noise in your images, so you might not notice that your ISO value is unnecessarily high. That’s why it is best to turn all custom settings off completely. Nikon has a set of Picture Controls available in its cameras. By default, a camera profile called “Standard” gets applied to images. That’s the Picture Control I typically use on all of my cameras. Whichever Picture Control you pick, I would suggest to stick to it if you want to see consistent colors in your images. And do not worry about modifying custom adjustments within picture controls, since those might also indirectly affect your RAW images as well (for example, setting high values for Contrast, Brightness and Saturation). Basically, these match the Picture Controls in your camera one to one. If you set your camera Picture Control to “Standard”, picking “Camera Standard” from the Camera Calibration sub-module of Lightroom / Camera RAW will imitate those exact colors (assuming that additional tweaking of Contrast / Brightness / Saturation / Hue was not performed in the camera). That’s why it is a good idea to stick to one Picture Control in your camera, because you can set that same Camera Calibration profile to all images every time you import them. Adobe also provides the ability to tweak individual colors for hue and saturation after applying a profile, but if you choose to do that, it will certainly deviate from Nikon’s original colors. If you want to always have Nikon’s native colors in your images and not the default “Adobe Standard” camera profile, you might want to set up an import preset that gets applied to your images when they are imported into Lightroom. This is a very simple and straightforward process, so let me show you the best way to do it. First, open any Nikon RAW / NEF file in Lightroom’s Develop Module. A new window will pop-up. Give the preset a name, for example “Import Preset”. The default folder “User Presets” is fine, but you can create a different folder if you want to. Great article. I, too, would be interested in how to address this w Leica images. Their tech support keeps telling me to use the JPEGs if I like the colors on the JPEGS… Arg.. Thanks for the interesting article, Nasim. I’ve long been interested in these things. I’m still not clear about a few few things, notably how the camera calibration is used, but I’ll read this article again. I also am wondering if the information you list that is “discarded” by LR actually is “discarded” or just not used. In particular, item 8….focus point location. I know that Aperture actually will show you where the focus point is. I know that while LR does not, if I am not mistaken, I think I have seen a plug-in which might allow you to use LR to see where the focus point is. But, I’ll have to look into that further. Just thought I’d mention it. I do want to have one question for you. I currently shoot with a Nikon D600. I usually shoot in RAW. While I never shoot in monochrome/black and white, I am curious about if you do shoot in Monochrome/BW, and in RAW, does the RAW file retain all of the color information, even if shot in Monochrome/BW? From what I have seen, just playing around with the D600, it does retain it because after importing the file into LR, I can change the image back to a color image. The reason I am asking is, is this true for most if not all camera models, Nikon, Canon, Sony, etc.? That is, if you shoot RAW and in Monochrome or BW, is all of the color information still there? Someone asked me this about his camera. I think the answer is “yes.” I am pretty sure, though, that all cameras discard all color information if the image is taken in JPEG. Richard, as far as I know, none of that information is actually recorded in Lightroom’s database…so it is simply ignored. It is nice that Aperture will read the focus point information, because Lightroom does not. People have been asking for that feature for years and Adobe still has not implemented it. There were some plugins here and there that attempted to read the data and provide it, but they were never finished. D600 is a phenomenal camera, congrats! When shooting in RAW, it does not matter what Picture Control you use. Even using Monochrome will still record all colors – only the JPEG file embedded into the RAW file is changed to Monochrome. Only when shooting in JPEG, whatever you pick is permanent! Excellent guideline for camera settings when using LR. This should have been your first article in your LR series ;-). I use some special presets for underwater photography to retain/push colours at different water depth based on profiles found in the internet. Do you think it would make sense to provide a library on your website? Everybody changes the images to their own liking but I find it very helpfull to have a good starting point. Christian, thank you for your feedback! Can you clarify what profiles you are referring to? Are you just moving the sliders, or actually downloading profiles and adding them to your computer? I was very glad to find the latter two for my Sony RX100M2 as there was no lens correction available and colour profiles have been slightly off. This might be a good opportunity for you while testing your old Nikkor lenses although limited since they have no chip for automatic recognition and distance control. Unfortunately, neither Canon or Nikon have colors that can be called “Accurate” in my experience. This is very evident when it comes to fabrics and skintones. Default Nikon rendering is yellow/green-ish, default Canon rendering is red/ magenta-ish. Now some people like this look, but if you’re like me and wish to have really accurate colors, use a color passport/ checker. I prefer to use the Spyder Chekr, which comes with a neat little utility of its own. Take a picture of the checker under your intended light source (Daylight, flash etc), change color profile to “Camera Neutral” as per Nasim’s steps above and then crop it down in Lightroom, choose edit in-> spyder Checkr utility and follow the steps in the tool. The tool then generates an HSL preset that is saved into your Lightroom presets folder. Now choose any image you shot with that camera under that light source, set the white balance, set the color profile as “Camera neutral” and then apply this HSL preset. Usually, I use this to get consistent and accurate colors from my two bodies, the D800 and the D7100 used in the same shoot. By default, they have very different color responses even with the same color profile. This is very evident when you’re shooting the same model with a wide on one camera and a tele on another. But with this method, I get the same colors from both. This even ensures consistent colors from Canon and Nikon cameras used at the same shoot. As mentioned above, default output from both brands look vastly different. If needed for artistic purposes, I then do the grading on top of this color corrected image. Sure! As Sandeep said, the passport chechker is the only way to get “accurate” colors, if we think at “accurate” like “Nikon’s way”. In my experience, and since now, I’ve had 2 Nikon DSLR: D70s and D300, the latter since this summer. What I can say is LR (ACR in general, as both Photoshop and LR have the same “color engine”) rendered very bad my D70s’ NEFs every time I shooted to something having a lot of Red/Magenta in the picture (like skin tones, that have a lot of red, or some flowers). Colors viewed via ViewNX2 was as the flower was, rendered via ACR were not. Skins were a problem too, expecially when yu had introduced a warm yellow/orange casting light in the scene (like at sunset). They were rendered in “a different skin tone”. Those two example simply mean that if you are giving an artistic interpretation to your shots it’s only up to you to decide “the nuance”. But if your model is dressing a pink or red nail polish, and your target is to prepare a brochure you have to exactly reproduce the colors that her nail polish liked “under your choosen source of light”. Our mind, throught our eyes, adapt to the light, but a camera do not. And it’s not only a matter of White Balance, but the way the digital info written in the “raw file” as a “raw sequence of 1 and 0” (setting a specific color per each pixel) are rendered. I could see D70s had hard problems, but D300 has not. So, even if the info added to NEF headed are not as “basic” as WB they can severely “cast” the rendered NEF. Then it’s up to our choice if using ACR (LR or PS) or View NX. I made some tests with my D300 + 50mm f/1.8 AF-S; I could see that always ACR renders the NEF about +0.5 EV “overexposed”. Anyway, “ACR engine” is more powerful, and let you manage the highlights, midtones and also shadows better than View NX2. There are differences between the 16bit TIFF exported from VNX2 and the TIFF16 bit exported via LR, but those differences are minimal. For this reason I always open the NEF vith both tools (Nikon SW and Adobe SW) and then decide which one is giving me the best starting point. But I do this only because I haven’t a “passport checker” and haven’t had the opportunity to “calibrate” the camera setting profile module in my ACR. Sandeep, I never wanted to say that the Nikon colors were accurate – I am aware of the fact that Nikon colors are different. The goal is to bring Lightroom to Nikon JPEG’s as close as possible and that’s what I meant by the word “accurate”. Also, please keep in mind that this article is meant to be a very basic one for beginners – it is not intended to discuss color accuracy or use of third party color calibration tools. I would like to see an advanced article on this topic some time in the future though, to learn how you do color management for your professional assignments. that would be a great idea :) ..
We spend thoudands of €/$ for DSLRs, lenses, to have the “high fidelty” in photography, but in he “digital era” we tend to forget that color accuracy, Color Spaces and all this “stuff” is very important ..
Are the Adobe camera profiles approximations ? Would the best color interpretation of the RAW file be rendered by say Nikon’s own RAW interpreter ViewNX2 or by LR? Sameer, those profiles were created by tools that read colors. Some people like them, others don’t – it is a pretty subjective topic. And you are not going to get much different stuff from View NX / Capture NX – they just make it easier by reading the info from files directly. I knew to change my images to camera standard after import, this is going to save a lot of time . Thanks !! Your’s is one of the best photo sites, practical down to earth information , no dreaming on what the camera companies should be doing. What is a good source for learning how to use Lightroom? I have LR 3, but have found it cumbersome and frustrating. I am not getting from it the efficiencies that others seem to be getting. Paul, we have plenty of articles on Lightroom, but if that’s not enough – check out Scott Kelby’s Lightroom book. I had recently noticed slight differences between my camera previews and LR imports. I had just recently started playing around with the camera calibration in LR, but wasn’t sure exactly what each setting was for (pretty much just made a mental note of what happened on each setting). Nice to know what that module is trying to do. It’s really amazing how much there is to learn about our cameras and software. I normally apply my presets in library mode under quick development together with some keywords and if necessary the location. Thank you for a great article. This was very usefull for me. I enjoy your website very much. I will be sure to start my photo shopping at your web site you you can benefit from my purchases. I really like the ability to control picture settings while taking the actual photograph. It has its benefits. When I take a picture of someone’s face, I want the portrait preset. When I want a black and white image, I know it beforehand, while taking the picture. When shooting landscape, I want that extra contrast punch. Having the ability to set the picture controls while taking the picture is a great benefit which saves time in post. It can always be reverted in the future since the RAW data is all there. That’s why I still use Capture NX 2 from time to time. I wish Lightroom had the ability to read the preset metadata. Oded, agreed – Lightroom should read this metadata from files. Aperture does, I don’t know why Adobe can’t or does not want to figure it out! Apart from, white balance, calibration, process version I find useful to add lens correction on import. I add that too, but I did not want to introduce it to this article, since we are talking about imitating camera JPEG colors only. I notice Aperture also changes the colors when converting RAW images. Can one use the same technique of applying presets to render the same colours as the jpegs generated by the Nikon D800? And yes, the above will work for the D800 as well. as always, a very helpful article for understanding what happens between taking shots and processing them. Thank you! Another issue that I have noticed before, but never really bugged me (until now), is the interpretation of White Balance. Since Auto WB never gets it right, I like to set WB to a fixed value of 5880 K, which in my taste is a perfect daylight temperature. But when I import those images into LR4, the WB “as shot” is always 5600/-8 – now where does that come from? Is it possible that Nikon and Adobe have different interpretations of what I thought to be a physical property? Fabien, I would not look at the LCD as the source of accurate color. Just like monitors and other displays, LCD screens can vary in color quite a bit. The above is mostly meant to imitate JPEG images rendered by the camera. When you look at a JPEG from your camera and your camera picture profile is set to Standard, changing to Camera Standard in Lightroom should result in a pretty close image. As for white balance, the tint affects the values as well, but it should be pretty accurate when “as shot” is picked. Fabien, an out of cam JPG is the same as the one embedded in a RAW file – the very first image in the article is actually taken this way. I extracted a JPEG image out of an NEF file, then changed a profile in Lightroom and exported the image again. Both are more or less the same, with very slight color variations. But this obviously is not a comparison between what you would see on the LCD (I talked about imitating the LCD screen, so that it connects with beginners). Most LCDs vary in colors, even between same camera models! (the D800 is a great example of that). This was a very clarifying explanation for a relatively beginner like me. I use Photoshop Elements 11 currently and tried to emaluate your steps in Elements but couldn’t do that. Is there a way to automaticly import my raw files with the Nikon “camera standard” changes? I have scoorde the adobe website, but cannot find a way to do that in Elements. Would be very much obliged with a way to do that else I may have to change software. Thanks for the tip for applying profiles on import. That will definitely save me time! I shall have to see if it can be applied to lens corrections too. Having never commented before, thank you for the excellent website too! I switched to LR4 from Aperture 3.4 when I went full frame. Aperture has lots going for it, back lack of distortion correction and processor and labour intensive chromatic aberration correction are weak features. Shame, as it handles metadata better (shows white balance, focus point, focus distance etc.) and is easy to use. I find your advice to be excellent, but on a few points in this article I would like to share a contrary view and see what you think. I shoot RAW, but leave vignette control, distortion control and high ISO NR on. I do this because I use the JPEG displayed on camera to give me a feel for the picture I intend to process. A vignette might indirectly impact exposure choice. Lenses with notable barrel distortion will lose items at the edge of the frame when corrected. Having a corrected JPEG built into my RAW file means I can see what is / is not in the final frame. Camera high ISO NR is usually not as good as post processing, but again can give you a feel. I also turn up the sharpness a little, not for the image quality, but to assist reviewing critical focus. I leave active D-lighting off though. My understanding is this directly impacts exposure, with the camera changing the exposure to reflect what it thinks it can recover from shadows and highlights, depending on the scene. Anyone else have a view on this? If I’m wrong I could turn all the features off and probably gain a few frames of buffer space from reduced in camera processing. I’ve read your comment with interest and I’d like to share my personal opinion with you. I think the question whether to turn VC, DC, NR on in order to check the intended result is also a question of the surroundings in which one is shooting. As for me, I am a concert photographer; 95 % of the time I shoot with ISO 1600-3200 and have to handle extreme contrast. Being able to check the dark and bright areas of the image as they actually are captured is therefore of utmost importance to me. Only when I can see how much information there is to work with, I can get an impression of what I am later able to achieve with the image. I totally understand your goal of getting a feeling for the to-be-finalized picture, but it only works in certain cases. Yes, you’re right about it only working in certain places and I can see why it would not work for you. I haven’t done much hand held low light shooting. Do you use active D-Lighting, or go the other way and use camera neutral picture control to minimize contrast? I think the quality of the lenses and what you are trying to achieve make a difference too. As for low-light shooting in general, two facts are most important: 1. Use fast lenses, f/2.8 or better; 2. Crank up the ISO, because image noise is the least annoying negative factor (plus: Active D-Lighting messes things up at high ISOs). I just tried making my own preset and it works perfectly! I am going to set one for all the colour picture controls. Thanks again for this tip! I like a vignette too and often add them in processing. My 50mm f.14 gives a nice vignette wide open, but I don’t like it on wide angle lenses or superzooms. Yes, the Nikon correction seems less aggressive than Lightroom on fixing barrel distortion, but closer than no correction. If you guys would just use Nikon’s software, Capture NX2, which is good enough quite frankly, then there would be no need to worry about any of these problems. Nasim, I totally agree with you. I have tried Capture NX before and I find Lightroom to be much better for post-processing. I would appreciate it if you could you clarify a point of confusion. Since the picture controls and the picture control settings are discarded how would changing the contrast, brightness, sharpening features affect the RAW data itself? Are you saying that these settings ie, for example, applying high contrast might give you a JPEG rendering on the camera LCD which might lead you to think you have blown highlights for instance when really you have not? Or are you saying the RAW data is actually changed? I have another tangential question. Does the lens really matter? Can you shoot a scene with very basic lens (lets say 18-55 kit lens) and edit the colors in lightroom to look like it is shot from one of the high end lenses? Why does the lens optics really matter if you are shooting RAW? So are you saying that if I selected Vivid in step 4 and shot my photos in a variety of Picture Controls (Vivid, Standard, Neutral, etc…) then LR will process each RAW file to Vivid regardless of Picture Control set within the camera (which I believe you are saying) or are you saying if I selected Vivid in step 4 and shot my photos in a variety of Picture Controls (Vivid, Standard, Neutral, etc…) then LR will process each RAW file to each respective Picture Control as set in the camera (which would be spectacular!!!). 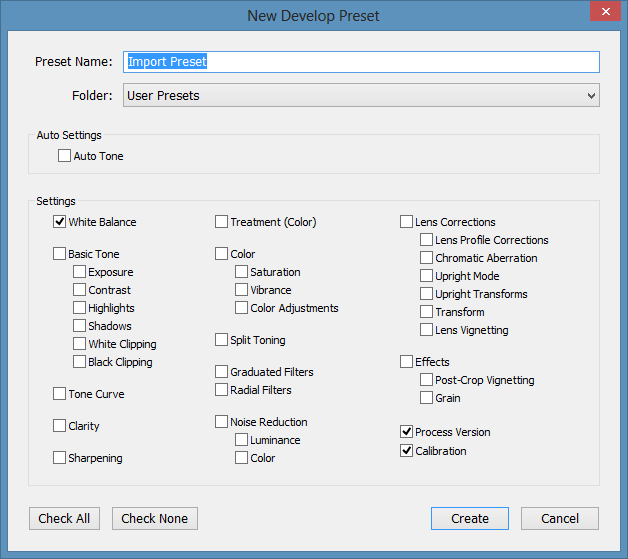 Why are in “New Develop Preset” only selected this options “White Balance”, “Process Version” and “Calibration”? What about sharpness and other options? Are we going to dismiss other settings from our camera? Thank you very much Nasim for this useful tutorial. Greetings. This is an awesome post, thank you Nasim. Very helpful for eliminating that weird magenta cast in my images under Adobe’s standard profile. Thanks again! I was so excited to see this. Especially with your side by side comparison of the couple, I mean you really can’t tell the difference! Problem is it didn’t work for me. I have sat night after night looking at the back of my D700 and wondering why the jpeg was so great looking sooc, but once I upload the raw file it looks completely different in Lightroom so I googled and came upon this. Which is no doubt great and helpful information! But I have tried all process and profile versions and nothing is the same as the back of my camera. For instance the picture I’m working on now has a rose haze color in the bokeh background. Once loaded in LR it is a green gray color, Any thoughts? Or something else I should try? Thanks so much! Thanks for the great article. Ive just moved from Aperture and the colours in lightroom really bugged me but following your article just plain worked! Finally I can now see why people rave about lightroom. Hope you still follow this thread. One question regarding the problem of color matching. I noted that what I see on my WinXP PC inside LR before exporting a JPG and the same thing once exported inside Windows is rather different! I see a lot of over-saturation in Windows, something that was perfect in LR. What is the reason according to you? I use RAW DNG with Standard Preset and my PC is color corrected by Spyder 3 running in background. The monitor is a standard super-market available thing, but it shouldn’t be its fault. The way LR shows my photos inside the same PC is totally different from the way the same pictures are reproduced with standard visualization utility inside Windows! Help! What shall I do? Thank you as always, your site is really a reference point for me! I want to sincerely thank you for putting this article together. I would literally sit here and tear up when I watched my beautiful colorful images tone down into drab lifeless pics. At least now I understand why this is happening, perhaps Adobe will modify light room in the future. Again thank you! You did something that even a face book page full of professional wedding photographers could not accomplish, answer a simple question! It is simply not true that LR camera profiles match the ones in Nikon DSLRs (I can speak for my D200, D3, D800). They differ from the colors rendered by Nikons picture controls and look dull. Try Capture NX2 and you’ll see how beautiful original Nikon colors are. Adobe did a bad job with LR 5 and ACR. I find it funny that a program like photomechanic can display the near perfect match to back of camera RAW yet adobe can’t. Hi Nasim l am quite new to photography so excuse me if l cannot explain myself too well. l have Photoshop Elements 7 installed on my PC and when l download images from my NikonD300 (Raw) it was fine, l have bought a new camera D7,100 which is fine but PS will not let me download the image, I can download into the software that came with the new camera but after that l am stuck. Any advice would be very welcome. Thanks for your time. PS. do l need to buy a new version of PS. Hi Nasim, I have a question related to the article. When I’m editing my photos, my wish is to get as close as possible to the colors as they really were. Supposing i don’t have a color checker, what is the best way to go: Adobe RGB or Camera Standard? Hi Nasim, good instruction of the camera calibration in Lighroom. Recently I shoot with my new Df in standard mode of the camera, it happened to me that the color rendering in lightroom is quite different compare with Capture NX although I choose the calibration profile Camera Standard. Why does it happen? Would it matter if WB was left unchecked in the create preset dialog i.e. if WB is unchecked would the effect be the same as setting WB to “as shot” and checking it? Great stuff but I have a question. I think the other thing that affects this is color space. With a camera like the D800 what color space should I use in light room and photoshop in order to see the picture as shot from the camera? I recently purchased a monitor calibrator (Color Munki Display). Should I set light room and photoshop to use this generated color space file from the Color Munki? The D800 has sRGB and AdobeRGB. The Monitor uses my generated color space file. What should I set my Light Room and Photoshop color space to? sRGB or AbobePro or AbobeRGB or my monitors generated color space? I want my display to look like my camera capture and my prints to look like my display edits. As you can tell. It’s a mystery to me? Sounds like there’s a little confusion going on here. sRGB, Adobe1998 and ProPhoto are color spaces. These spaces each have a gamut that reflect the total number and hue of colors that can represented within each space. Think of them as buckets that hold colors. Of the three, sRGB has the most limited space but most closely matches what a typical computer monitor can display. Adobe1998 and ProPhoto have larger color gamuts and are therefore better for editing and post-processing. You may not notice the increased size of the color space on your screen however. In fact, it may seem that Adobe1998 and ProPhoto are duller and more “washed out” than sRGB. Don’t let that fool you. The data is there and as you edit and adjust your image it’s being used. When you calibrate your monitor you are creating a profile that is intended to ensure the monitor is accurately displaying all the colors it is capable of producing. These profiles can even account for the lighting conditions you work in if you so choose. The profile you create does not mean the monitor can produce more colors or less it just ensures that what it is displaying is accurate. Unless you have a very high end monitor the gamut of colors it is capable of displaying is less than what your camera can record. The final link in the chain is the output. If you are printing you have to be aware of the color gamut your printer is capable of. If you’re printing to a desktop printer the color gamut will depend on the ink system used and the paper you’re printing to. If you’re sending your work to a lab they will often provide profiles for their printers so you can get close. If your outputting for the web you’re pretty much stuck with sRGB and the hope that things will look right when you put it out into the world. So, to directly answer your question, the best way to work is to create a profile for your display, edit in a colorspace that gives you the latitude you need and then output in a format that is right for your intent. If you’re going to print you may consider editing in Adobe98 or ProPhoto but if you’re going to the web sRGB is the best way to go when exporting a Jpeg file. D7100 – I use Camera Standard in both camera and in LR and the results are quite similar. AdobeRGB appears to be less contrasty, flatter, yet richer in the shadows. D3S – I use Camera Vivid in both camera and in in LR yielding close enough results. Camera Standard looks terribly flat (to me). D700 – I use Camera Standard in camera, but am undecided on a LR camera profile. The embedded JPEGs look great but I cannot find anything that approximates them in LR. Camera Standard and CS V4 are too contrasty and there is way too much green tinting. The closest match is something along the lines of Camera Vivid combined with +30 magenta tinting to compensate for the green-ness and possibly +0.3 / +0.5 EVs of exposure. FWIW, I have a Dell U2713h calibrated via Xrite i1Display Pro. Has anyone found a viable solution for the D700? Buy colorchecker and create one for your own camera. I am always amazed that people make the workflow so darn difficult. Why throw away all those useful features like vignette control, distortion, and color profiles just to use lightroom or pshop? import raw with capture NX save the jpeg output and edit to your hearts content in ps after. Carl, editing JPEG images is editing 8-bit files that have nothing left in them. For a person that uses Lightroom or Photoshop heavily, those settings are thrown away, so what’s the point? Capture NX is dead, now you have to move to NX-D, which is too buggy at this time. Perhaps with time Capture NX-D could become a useful tool, but for now, it is nowhere as good as Lightroom is. Thank you for this incredibly insightful article…seems to still be helping a lot of people! Follow-up beginner’s question for Photoshop, which I feel is really basic, but can’t seem to sort out. Thanks to your info, I’ve matched my camera profiles – for myself it’s Camera Neutral – between my D5100 and Camera Raw editor. I did a shoot & captured RAW & JPEG simultaneously, and of course there are noticeable differences between the 2 versions of each photo. Problem is: I import the NEF into Camera Raw, make my adjustments to clarity, tint, etc, Open Image, carry on w further adjustments in the regular editor. All is well. I save the JPEG which originally started as RAW. BUT when I open my new JPEG in photo viewers, it does not at all resemble the image I saved in Photoshop. In fact, it more resembles the original JPEG version of the photo! What am I doing wrong??? Is this an issue w/my PS color settings? Your help is much appreciated. Thank you! Will this work when using different color profiles within the same import? For example if I use Vivid (VI) on one photo, Portrait on another and Landscape on another, will I recover each of those color different profiles for the different pictures? Or will all photos use just one profile (Vivid for example)? I don’t know how to thank you for this article. For months, I have been in this confusion. Every time I open my photos in Capture NX 2, they look just as shot and displayed in Camera, but whenever I open them in Lightroom or Photoshop, the colour tone changes. I followed your instruction and now I am relieved. They just look same in all the places. Thanks a tonne. I hope it is not too late to get into the conversation. I find that Adobe Lightroom has some quirks and it is sometime annoying. I never used Nikon’s Capture NX so maybe someone can help here; Would it be better to bring the RAW photos into Capture NX first, do the basic adjustments (as many claim are better than LR), then export everything as DNG and then import them into LR as DNG? Assuming the corrections are now embedded in the file, would that create a better image? You’re on the right track. I’ve always thought Capture (NX / NX-D) displayed images consistent with what I expected “out of camera” to be. I got frustrated seeing Aperture, LR render the same RAW/.NEF differently and neither rendering was close to what I saw in Capture. I use Capture to review images out of the camera and then export my “selects” to TIFF for import into Aperture or LR. The exported TIFF can be brought into LR, PS, Aperture, etc and render consistent with what I saw in Capture and then I start my edit workflow from there. I like doing all my edits in one application so I have the entire edit history in one place which is my personal preference. The one thing I really don’t like about Capture NX / NX-D is it’s stability (at least on Mac) which I think is poor hence I use it as a simple viewer and export facility. IMO the printing capabilities of Capture is lacking compared to LR, PS, Aperture which is OK but for me is another data point not to use Capture for anything but view and export. I do like that Capture doesn’t have a silly catalog or library facility which means I can throw my images on the file system and simply look at them versus having to wait for import. It doesn’t hurt that Capture NX-D is free. Bottom line Capture does the best job of rendering your .NEF’s without hassle creating baseline images for whatever post processing environment you want to use. Thank you very much for your reply. I will definitely give it a try, I am curious to see how it helps image quality vs. work flow. When you work with the “raw” images you can recover a lot of details, but once you change to the “tiff” format, are you going to keep that possibility ? In other words, is it the same to work with a raw image and with a tiff one ? Greetings. The short is answer is you will have the ability to recover details as if you were working with the original .NEF/RAW. ———- all of the settings above are “unique to Capture” so you’ll want to adjust those items as desired since the exported TIFF will reflect those choices. You may want to export versions of a given file to reflect various combinations of Active D-Lighting, Picture Controls, etc…. Most RAW formats ( including Nikon and Adobe DNG ) are based on the TIFF specification meaning each vendor starts with a standard TIFF spec and then adds vendor specific (proprietary) header information. In other words your camera is storing image data in a TIFF to begin with, it’s just that the camera vendor adds a bunch of stuff to the front of the file that in this case only Capture can read and make use of. So (at a very high level) when you’re exporting from RAW to TIFF you’re essentially exporting TIFF to TIFF. What I meant to say is the exported TIFF will reflect the Capture specific edits (Picture Control, D-Lighting, etc) but since Aperture, LR, PS , etc. don’t have the capability to change Picture Control, D-Lighting, etc you obviously won’t be able to change those items in applications outside of Capture which is fine. Thank you Brian for the information, but it seems that not very much things are going to be left to post-process in Lightroom. Greetings. All of the “data” is still available in LR, PS, Aperture, etc. LR, PS, Aperture and other applications don’t have Nikon specific presets such as Picture Control and D-Lighting but you can still control the image through manual adjust of brightness, color, exposure, levels, sharpness and white balance to achieve what the presets in Capture offers. The items Nasim calls out in his original post are only presets that reflect color, . Exporting your file from Capture to TIFF preserves everything displayed in Capture but frees the data to be edited in post-processing environments that are more stable and provide enhanced edit capabilities compared to Capture. This thread originated from the desire to edit in LR, PS what was seen in Capture and that is exactly what exporting from Capture to TIFF allows. Thank you very much for the information. Best wishes. Change your settings in your nikon camera to Adobe RGB. Located in shooting menu in the color space tab. You wont regret it. Following the comments of Motti, Brian and Jorge, i change my workflow. Now I start in Capture NX2, making the basic adjusts to the NEF files and exporting TIFF files, which I open in Lightroom. Working with the TIFF files in Ligthroom show no difference with the NEF, has i previously used to do. Capture NX2 gets the NEF files with all the adjusts, just like in the camera. Unfortunately, though the info on the profiles and presets is interesting, it does not help match the colors produced by Nikon’s View NX-2. Even without trying to produce one of the JPEG settings, it is clear the colors of the D750 are completely different in LR5 as opposed to Nikon’s software when opening a RAW file. The histograms alone tell the tale. Only D90 looks pretty close to me. Before introduction of Picture Controls there were Nikon I, II, IIa profiles and I can’t replicate them in any Lightroom unfortunately so editing nef’s from older cameras is not that easy if you want to maintain Nikon’s colors. The problem I have now with my D610’s nef’s is that in some cases (portraiture or low light shots) even using Adobe’s Nikon Standard profile I can’t get close enough to what I can see in Nikon’s software using also Nikon Standard. Usually the problem is within ADL which is discarded by LR but even if I disable ADL in Capture NX-D (in post) and get picture darker and match look in LR (eventually I increase exposure and shadows to get it right in both apps) then closer look at skin tones is a nightmare, color is different and over saturated, over sharpened details, bad looking gradients so skin looks terrible comparing to soft look in Nikon’s software. I don’t see this in all pictures, but to often unfortunately. Also I notice similar problems in night sky shots I can see terrible gradients (almost purple-blue dithering) when in Capture NX-D the sky is smooth and looks right. My D810 was being renders all wrong in Lightroom CC and driving me insane. Files became dark and and muddy. Creating a preset with the camera profile and applying during import vs Adobe RGB solved the problem. Question – Where does the ICC profile come into the equation. Does not the Nikon software apply a specifc ICC profile and if so will not applying the same profile to their .NEF file (in Lightroom) render the same ‘look’. Thanks for an enlightenibg article. I created the Import Preset as you instructed. Then I imported one folder. in portrait some in Landscape, some in Vivid. thank you for the great article Nasim. I was going to ask the same question as Apurva Madia. I created the Import Preset as described in article but during the import my 3 test photos were rendered as “Standard”. I shot 3 test photos as Portrait, Neutral and Standard – all of them were rendered as Standard in Lightroom. Are you sure that every time I change the profile in my Nikon camera, Lightroom will do the same during the import? For me it doesn’t make sense….we defined “standard” in preset, how come LR will chose profile set in camera? Unfortunately LR does know nothing about builtin camera profiles and will always render as what you set in your import profile (in your case “Standard”). I have mine set to “Standard” during import as that gives me a good starting point then if there’s a need I change group of photos later using other profiles I prepared for that purpose so “Vivid”, “Landscape”, etc. This way I can quickly change calibration profiles for single or photo group and this is much faster than digging into calibration tab in develop module every single time. By the way, funny thing is that LR does not apply say “Nikon-Standard” or “Nikon-Portrait” it is always “Camera-Standard” or “Camera-Portrait” so once you set your profile for “standard” it will actually cause different effect to Nikon and to Canon RAWs. Cool! I use Lightroom 5.7 with D810, and the JPG images are significantly different from the LR “emulated” profile on the NEF files. I am looking for custom tuned curve or any solution to be able to reproduce the SAME image in LR from NEF. Have you tried to disable the ADL feature? Photos without ADL with LR profile applied, however not perfect, are much closer to JPGs with same profile. I do not use any fancy image magic on the camera. ADL was never turned on, since I know it has no effect on NEF files. Thank You anyway for the reply! I shoot RAW on SD1 and Jpeg on SD2 – will the list of settings applicable only to JPEG be automatically applied to them but not to RAW? Thank you so much for your important article! I hope this will be helpful for many Nikon photographers in Germany! I send out my wedding pictures to Post House Inc. for post-production, because who want’s to deal with all of those images after you’ve worked all day to take them. They are very nice people and they’ve been telling me that I need to switch the “Adobe Standard” profile to a camera profile like you mentioned. It’s good to hear that they are providing accurate advise that will help me and my images. This is a option that I’ve begun asking for each time I place an order. Thanks for the article confirming what I’ve been thinking. I just to this page and saved a ton of time. I just chose camera vivid and done! I see images the way I did on my camera. I really felt those values are lost. For all this while I’d to keep moving the contrast and black sliders around. This is magic ;) And here I was not happy with nikon’s colors. Is this method followed regularly? Just a thought in my head. Hi – i’m sure you have covered this elsewhere – but how to get accurate colours in Lightroom, when the default camera calibration profiles is not doing the job. Adobe sometimes takes its time to update LR and ACR camera calibration profiles to reflect the very latest cameras in the market OR simply does not offer coverage of your camera in their profiles — I had horrendous results when I first got my D500 and it was because the Adobe profile was not yet accurate. It was later, in memory a month later. So what do you do in the mean time OR what do you do in mixed lighting set-ups. How do get the correct mix of colours in the camera calibration to “faithfully” recreate what is seen in the real world (presuming amongst other things the same reference light as the calibration being used). This varies between camera bodies — and some lenses too. Having the right mix of colours faithfully represented in your RAW conversion. The first step is to have an accurate profile for your camera. The second is to have a profile for the lighting set-up you had for your shoot. I have used the XCCP approach both when the Adobe profile gives entirely wrong results (normally when the accurate profile as not yet been released for the camera) — or when I have to be very confident that colours need to be right (typically when there is mixed light sources or a client needs the correct result). 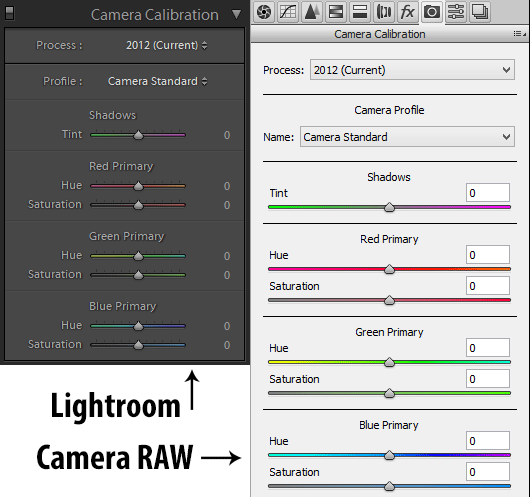 I have loaded Reference Calibration Profiles for each of my camera bodies shot under 5500k lights in to LR CC and ACR. While as at this date, I am happy that the Adobe Standard profile is adequately accurate for my 3 main camera bodies – D5/D500/D810 – I use these to check the colour rendition of my select images for sale on my computer and on printed test cards from my printer to ensure that my colour calibration and my printer’s calibration is all in sync. STEP TWO – right colour for the lighting of your subject — The starting point is to use a WB card. Now I’m primarily a wildlife photographer and don’t have options for my subject to hold a XCCP or Grey Card – I simply use WB of 5500k. However, most/all of my headshot, portrait, fashion, real estate and product professional photographer buddies use an XCCP each time they have different lighting set ups. This allows them to get perfect colour representation – using the profile for each set up for all the shots in that set-up. They are very slick in their workflows. Most have built presets for each set-up and camera body. IF you are happy with pleasing color, that is good. Now tell us how accurate the profile is compared to the original profile. Or in the case of the article above, the JPEG and the raw. There is only ONE way to provide that metric and since you’ve failed to produce scene referred color, you can’t compare the captured data to the scene data (nor have you measured anything at the scene) so how can it be accurate? That is just a marketing term! You want to discuss accuracy, you need two sets of data and you need to provide your audience with a deltaE metric of the differences along with what dE you find acceptable (and an average of how many colors)? In this 7 minute video I’ll cover: What is Delta-E and how we use it to evaluate color differences. Color Accuracy: what it really means, how we measure it using ColorThink Pro and BableColor CT&A. This is an edited subset of a video covering RGB working spaces from raw data (sRGB urban legend Part 1). I just used my foot to measure the distance for a new garage. Is it accurate? Pull out a ruler and compare what you measured with your foot and what the ruler provided. Two sets of data. Compare and report the distance: you can provide a metric (for example, +/- 12 inches) and your audience can now tell you if the measurement is accurate and accurate enough. Being off by a foot when measuring this garage? No. Off 1/100 of an inch; fine. In color, deltaE tells us exactly the same data points. Without such a metric, the discussion of color accuracy is speculation or marketing hype. Andrew, thanks for dropping by and leaving a comment. “Accuracy” is a very relative term in this particular case. When I say that one can simulate the look of the image in Lightroom to the look of the camera’s LCD, even that is very relative and potentially quite inaccurate, because LCD screens themselves do not reproduce color exactly the same across different cameras. None of them are color-accurate and none of them are calibrated, which is why we occasionally see complaints from photographers on LCD screens having particular green or magenta tints and that’s why manufacturers like Nikon now allow us to tweak the color output of LCD screens. The article is aimed at beginners, who are frustrated at the color differences when they import RAW images into their Lightroom catalogs. Just changing the color profile in the camera and matching that in Lightroom will make colors look more or less similar, which is a good starting point for some photographers. Many of us pros know that there are far better tools to make colors much more accurate by using X-Rite ColorChecker and similar products to create our own color profiles. However, most beginners and enthusiasts won’t care to do this, since they do not need it. Many of them don’t even have a color calibrated monitor in the first place, so any talk about color would be pretty much useless. Hope this makes sense. Thank you for sharing your knowledge – I have seen your website before and I love the content you put out. May I suggest that rather than using accurate color which isn’t at all defined above you use “matching” or pleasing color? Many thanks for your valuable time dedicated to improve the understanding of photography, also I do appreciate you knowledge sharing. I have been using Lightroom to develop part of the files that I capture in Nikon D800E, but doesn’t matter which camera calibration I use the colours and the contrast don’ represent reality. I learn that with a Color Checker Lightroom can build a profile, without going into details I did so and name it, now the Color Checker displayed colours matched very closely the original, but when I applied this camera calibration to other photos with skin tones the end result was not good. I finally using a raw file from the color chequer and applying camera standard and then adjusting the colors, I manage to get a very similar result to the color checker profile, afterwards I did apply this new set of color correction to photos taken in the same circumstances and I got very good result. The only color that I was not able to match was the magenta saturation. I don’t understand why the color profile generated by Adobe Lightroom 6 was very close to the original and why when applied on other pictures taken under the same situation did’t came well. The article has absolutely nothing to do with getting accurate color. Matching a JPEG of pleasing color from a camera; maybe. Accurate color is gauged from colorimetric analysis of a source (reference) set of colors at the scene and the analysis of the capture to produce an accuracy metric (deltaE). Andrew, I believe we have already exchanged some comments above, not sure why you are repeating the same info. i use the Flat jpg preview on my Nikon D750 because it seems to calibrate my histogram most correctly. lightroom does not even offer a Camera Flat profile. aside from creating a custom profile, which i’m not even going to attempt. any ideas on getting a similar import setting ?? Lightroom DO have Flat profile for D750 too. I do not know the minimum version for this feature, but You can google that.